We’d love your help. 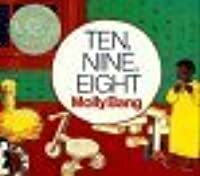 Let us know what’s wrong with this preview of Ten, Nine, Eight by Molly Bang. To ask other readers questions about Ten, Nine, Eight, please sign up. A gentle rhyming bedtime/counting book, with colourfully expressive illustrations, Molly Bang's Ten, Nine, Eight is a soothing lullaby for young children (about their various bedtime routines), whilst also counting down from the numbers ten to one. For an adult, the author's presented and featured text might feel a bit lacking in substance (and the first rhyme sequence really does not seem to work all that well either), but for the intended audience, for toddlers just learning their numbers, it A gentle rhyming bedtime/counting book, with colourfully expressive illustrations, Molly Bang's Ten, Nine, Eight is a soothing lullaby for young children (about their various bedtime routines), whilst also counting down from the numbers ten to one. For an adult, the author's presented and featured text might feel a bit lacking in substance (and the first rhyme sequence really does not seem to work all that well either), but for the intended audience, for toddlers just learning their numbers, it sweetly and soothingly hits the proverbial spot. I'm obsessed. Why is Molly Bang the greatest woke white lady in kidlit? This book--FIRST PUBLISHED IN 1983--features a black dad and his daughter at bedtime (!!!). That's an amazing dismantling of the stereotype that black fathers are "absent" and "unsupportive" right there. It's also a great counting and going-to-bed book for toddlers, really it's a countdown to bedtime book. There are so many easy-to-name items (shoes, cat, ball, etc) to look at, name, and track throughout the spreads. Coupled I'm obsessed. 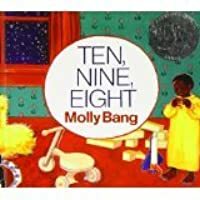 Why is Molly Bang the greatest woke white lady in kidlit? This book--FIRST PUBLISHED IN 1983--features a black dad and his daughter at bedtime (!!!). That's an amazing dismantling of the stereotype that black fathers are "absent" and "unsupportive" right there. It's also a great counting and going-to-bed book for toddlers, really it's a countdown to bedtime book. There are so many easy-to-name items (shoes, cat, ball, etc) to look at, name, and track throughout the spreads. Coupled with Bang's use of zooming in and out of perspective to reveal more parts of the little girl's bedroom, these repeated items really help young minds piece together the fragmented space. I understand why it received a Caldecott honor. One of the 1984 Caldecott Honor books is this bedtime story. In it we see a countdown, that is shown backwards, beginning in ten and ending in one. This backwards countdown takes place in the room of a little girl, whose father is preparing her for bed. First shown are ten toes;. second come nine toys; third come eight squares on the window panes; fourth come seven shoes; fifth come six seashells; sixth come five buttons; seventh come four eyes; eighth come three kisses; ninth come two arms; las One of the 1984 Caldecott Honor books is this bedtime story. In it we see a countdown, that is shown backwards, beginning in ten and ending in one. This backwards countdown takes place in the room of a little girl, whose father is preparing her for bed. First shown are ten toes;. second come nine toys; third come eight squares on the window panes; fourth come seven shoes; fifth come six seashells; sixth come five buttons; seventh come four eyes; eighth come three kisses; ninth come two arms; lastly comes one big girl. The story is intended for pre-schoolers. You can tell because it counts with very basic vocabulary. It is perfect to be read to a child before bedtime. The child can easily follow the words without distractions, for they are in a separate page and written in black. In the page of the words, the only color is of the number, making it pop out from the text. And on the page on the right, you see what the text described in vivid and brightly colored illustrations. The pages also end in a rhyme with the next page that catches the children’s attention too. I consider this to be am excellent bedtime story. It gives you a serene and mellow text to accompany realistic pictures to let the child unwind. I also appreciate the fact that it is counting backwards since this is somewhat neglected with always counting forward. And also, the more complicated pictures, or the ones with the most drawings, are in the beginning when the child is wide awake. And the text being simpler, and also the pictures, with each passed page helps get to the point of falling asleep. Ten, Nine, Eight is a Caldecott Honor Book. It is a poem that the author wrote for her daughter while she was away. It is a counting book and it is about a child getting ready for bed. This would be a great book for Pre-K, maybe Kindergarten, students. It is a really cute book and is super easy to read. I would use this book when teaching counting in class. I think all Pre-K students would like this book. They would be able to relate since the child in the book is about the same age. I would use this book in groups with my students to go over the words in the book. Pronouncing them and maybe the rhyming of them. I would read this book aloud to go over counting and have the students write their own counting story. Ten, Nine, Eight by Molly Bang is a picture book. It is a Caldecott honor book of 1984. The age group this book is intended for is nursery. The book is a countdown to bedtime. I thought this was a good bedtime story and I like that each time you look at the pictures there is more to find. If the child is a little older, he/she can count the number of items on each page, some more difficult to spot than others. The good thing is the numbers go down so as you are trying to get them to sleep they don’t have to search or think as hard as they may have at the beginning of the book. Or, after several times of flipping through, the next page may have something from the prior pages to notice. The pictures are soft and many outlines were done in a color other than black. The page with the writing is white and the only color on that page is the number; the words are in black print. I would recommend this for young readers because the beginning makes you think more to get you tired and ready for bed. 2. Summary: A young girl gets ready for bed by helping her father count all of her cherished items that can be found in her bedroom. a. One of the greatest strengths of this book is the use of adjectives by the author. b. Molly Bang helps her readers get ready for bedtime by taking them through a young girl’s bedtime routine of counting the items she loves in descending order. 2. Summary: A young girl gets ready for bed by helping her father count all of her cherished items that can be found in her bedroom. a. One of the greatest strengths of this book is the use of adjectives by the author. b.	Molly Bang helps her readers get ready for bedtime by taking them through a young girl’s bedtime routine of counting the items she loves in descending order. “10 small toes all washed and warm” (p. 1). Each item or noun that Bang presents is accompanied by a descriptive adjective that accurately compliments her illustrations. Not only are the toes described as being small, but they are also warm. Any child reading this book with his/her parent will naturally feel a warm feeling wash over their own ten little toes. c.	In addition to the wonderfully descriptive language throughout the story’s entirety, Bang also incorporates a rhyming scheme for every two pages. “8 square windowpanes with falling snow” (p. 5) and “7 empty shoes in a short straight row” (p. 7). Children are not only learning the numbers one through ten, they are also being introduced to descriptive words, or adjectives, as well as rhyming words. 4. Curriculum Content: Ten, Night, Eight is a great story for teachers to use in the primary grades. 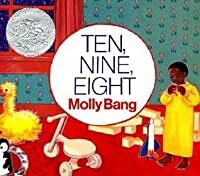 Molly Bang has written a story that can be used for many different topics including: rhyming words, counting (in descending order), descriptive words, and even the primary colors. Bang uses a vibrant yellow for the young girl’s nightgown, a strong red for the carpet, and a bold blue for the night sky. A short, sweet counting book (counting down from 10 to 1) perfect for bedtime for little ones. It's hard to believe that this is written and illustrated by the same woman that wrote and illustrated The Grey Lady and the Strawberry Snatcher. The two books are completely different in tone, length, illustration style, etc. A very short phrase on the left-hand page is accompanied by a lovely painting on the right-hand page, with a black cat in several of the pictures. Another nice feature is that it is Dad putting the child to bed, thus acknowledging the importance of dads in a child's life. 1984 Caldecott Honor - Favorite Illustration: 3 kisses on the cheeks and nose - it is so sweet! This is a tender little bedtime story as well as a counting book. I love the way each page is illustrated with a daddy tucking his kiddo into bed. A simple little story, a great read to a little girl before going to bed. A very sweet bedtime story featuring counting. Recommended for bedtime reading! A really lovely book that can be read at all sorts of levels. The counting theme itself is nice, but it's fun to see what else is going on in each illustration - and yet the pictures don't seem busy at all. Quite the opposite - they're so cozy! I had even noted to myself that it was great how the book depicts a girl with short hair, which was useful in discussing with my toddler that anyone can have any length hair. But then I was reading an article for the book's 35th anniversary in The Horn Bo A really lovely book that can be read at all sorts of levels. The counting theme itself is nice, but it's fun to see what else is going on in each illustration - and yet the pictures don't seem busy at all. Quite the opposite - they're so cozy! This book features a young girl getting ready for bed, but does so very subtly. The book counts down from 10 and shows the girl putting her stuffed animals away, reading with her dad, and giving goodnight kisses. The book is really calming, and would make a great bedtime story. “A short, gentle mood poem which counts the reader down to bedtime with a black dad and his small daughter. The warmth and leisurely together time is perfectly caught both in the words and the glowing pictures. A lovely book for sharing with the very young. Category: Nursery/Infant. . ...., Picture Puffin, 1.50. Ages 2 to 4. Like the review states, this book perfectly captures the warmth between father and daughter as he tucks her into bed. Until I read the first professional review, I didn’t even notice that each picture foreshadowed what was to come. Both reviews are positive, and after reading this book, I would have written a positive review as well. This book would not be one I would introduce into my classroom, even though I really enjoyed it. I think I would suggest this book to parents as a way to promote literacy skills at home before bed. The book is quick to read, and features simple text that would be great for a parent and a child to read together or even for the child to read to their parents. Brief Book Summary: This book is about a little girl and her father reading their own version of a bed time story. The two count down from 10 to 1 depicting different things around the household. Response to Two Professional Reviews: I believe both reviews strongly reflect the depiction of this counting book and its values. I think that counting backwards before going to sleep, noting the daughter’s surrounding is very powerful at bed time. Additionally, the pictures and words correlate to near perfection giving the reader, which both reviews note. Evaluation of Literary Elements: This book is designed to be read at bedtime but can be read during other moments as well. This book offers readers a way to learn how to count down from ten, by offering a clear plot line. This book also offers a rhyming pattern between numbers, and gives a deeper meaning to the plotline. "Ten, Nine, Eight" by Molly Bang is a sweet rhyming bedtime story. It counts down from ten as it describes the process of a father and daughter getting ready for bed. At first, this story did not seem interesting to me but when I remembered the intended audience I thought changed my mind very quickly. Despite it being a very simple story, it has a lot to offer with rhyming, counting, and a comforting story for younger children. 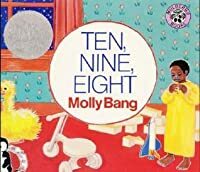 I really appreciate that the story counts down from ten instead of c "Ten, Nine, Eight" by Molly Bang is a sweet rhyming bedtime story. It counts down from ten as it describes the process of a father and daughter getting ready for bed. At first, this story did not seem interesting to me but when I remembered the intended audience I thought changed my mind very quickly. Despite it being a very simple story, it has a lot to offer with rhyming, counting, and a comforting story for younger children. I really appreciate that the story counts down from ten instead of counting up from one which is what is typically seen in counting books. It helps to teach kids how to count backward, which is a very important skill as well. The illustrations are simple as well but go along very well with the tone of the story. There are many colors that are warm and inviting and the illustrations do a good job of explaining the text. Each page has items that the children can count as well. For example, the page that represents the number seven says "7 empty shoes in a short straight row", and the illustration has seven pairs of shoes. This could be really helpful for kids to not only learn their numbers but also how to recognize what 7 items look like. They could count them one by one, which would really help them with their counting skills. I really liked this cute book, and I thought it was an effective bedtime book. The colors were soft and made the feeling of a calming goodnight sink in because there wasn’t any sharp imagery. Each [age and subsequent thing includes a piece of the other page to connect them. For example, there are nine stuffed animals, and in the next page the stuffed animals are in the background. One of the seven shoes is shown on the next page too. The lines aren’t aggressively outlined, providing a calming, so I really liked this cute book, and I thought it was an effective bedtime book. The colors were soft and made the feeling of a calming goodnight sink in because there wasn’t any sharp imagery. Each [age and subsequent thing includes a piece of the other page to connect them. For example, there are nine stuffed animals, and in the next page the stuffed animals are in the background. One of the seven shoes is shown on the next page too. The lines aren’t aggressively outlined, providing a calming, soft image further throughout the book. The colors are very vibrant and eye catching, but not in a way that it distracts from the story or are too loud for a book about bedtime. The book also uses good descriptive words to describe the things, ranging from simple words like “square windowpanes” to “pale seashells.” This matches the images on the page and helps kids learn the adjectives surrounding them. The pictures really add to the story, since the sentences themselves are rather simple. Readers see all the words really come to life with the illustrations of the snowy weather outside the windowpanes and the little girl being held by her father as she hugs a soft bear. Ten, Nine Eight is a recipient of the Caldecott Honor. It was written and illustrated by Molly Bang. It is a countdown from ten to one in a little girl’s room who is getting ready for bed. The main characters are the little girl and her father. The point of view switches from the little girl to a third person perspective (only in the illustrations). It is written in a lullaby format. She starts with ten, when she counts her ten toes. The countdown continues to number five, where the little girl Ten, Nine Eight is a recipient of the Caldecott Honor. It was written and illustrated by Molly Bang. It is a countdown from ten to one in a little girl’s room who is getting ready for bed. The main characters are the little girl and her father. The point of view switches from the little girl to a third person perspective (only in the illustrations). It is written in a lullaby format. She starts with ten, when she counts her ten toes. The countdown continues to number five, where the little girl counts the five buttons on her gown. It continues to number one, where “1 big girl all ready for bed”. This little African American girl gets ready for bed with the help of her father. It is a good book because not many books include father figures in them. Ten, Nine, Eight shows the bond between the little girl and her father. This book is good for preschool kids and kids who are transitioning to sleep in their own bedrooms or even for those moving from a crib to a big girl/boy bed. The illustrations have very bright colors. These colors can also stimulate even younger kids. Teachers can use this book for kindergarten and first graders. Ten, Nine, Eight can help students with number recognition and how to count backwards. Kids can also share some of their own routines for going to bed or their routines when getting ready for school. This book also contains rhyming words. Kids can find these words and come up with other rhyming words. Even though this is a fairly short and easy read book, there are many different things that kids can get out of it. Where’s the Math: This is a counting book, but all the items being counted backwards from 10-1 are related to a young African American girl who is going to bed. So, we begin with “10 small toes all washed and warm” and end with “1 big girl all ready for bed”, and in between we see 9 stuffed animal friends in her room, her 8 window panes with snow falling outside, 7 of her shoes, a mobile made of 6 shells, 5 buttons on her nightgown, 4 sleepy eyes (hers and her fathers), 3 kisses, and 2 strong arms as she hugs her teddy bear. The descriptive language of items that are important to this child combine with the colorful and folksy illustrations to create a really charming counting book that shows that even at the youngest ages, numbers are all around us. Age 2 and up. Features of print: Small amount of text, very descriptive in nature; folksy, painterly, colorful illustrations. Cultural considerations: Features African American family. Open Ended Question to invite mathematical thinking: What else can we count in this book? Extension Activity: Assign groups of students to different parts of the room and ask them find out “how many” there are of at least 3 things in the room. Alternatively they could “find the math” in their own bedtime routines with their parents. 2. This is a counting book that uses large numbers and colorful pictures introduce children to the idea of counting backwards. b. I was glad to see an African American family featured as the characters in the illustrations in this book. The majority of the children’s books I read as a child, and have read through school, typically feature a white family. Providing counting books with diverse ethnicities gives all children a chance to feel more connected toward the story. The reading is made more meaningful, which helps children remember the concept of the book more easily. c. The warm illustrations in this story show a father putting his daughter to bed. On one page it shows the little girl kissing her father goodnight. Bang was smart to use this bedtime ritual that almost all children can relate to. This helps children gain the notion that although they may look different, they really aren’t that different after all. 4. Students could make their own counting books using their bedtime routines. They could go home that evening, and count the things in their room and draw pictures of them. They could then write sentences explaining what they drew like in the book. The last picture in the book would be them lying in their bed. This could also be done with photographs and their parent’s assistance. Students could share their final products with the class. Students could make a class book using counting and some type of procedure in their classroom such as lining up. Summary: This concept book is a countdown to bedtime using the things in a child’s real world. Critique: A. I like the way this book uses a theme of order to let help the child feel at ease so that she can sleep. B. What makes this theme strong is that the objects that the author has chosen to order her world are quiet things. There is no indication of talking, singing, or music to get the child to bed. Only quiet order is used. C.	This can be seen best on page 6. The number eight is shown with the words “square windowpanes with falling snow.” The windowpanes are lined up side by side. Two at the top two, at the bottom with the adjacent window exactly the same. They remind me of eyes that help the child look out into the night to see snow falling. The eyes are quiet, night does not make a sound, snow is calm, and the windowpanes frame the silence outside...neat and orderly. 2. This Caldecott Honor book is dedicated to those final moments before bedtime. The reader counts backward from ten as he or she inspects the warm and washed toes of a young girl getting ready for bed, see the five round buttons on her gown and feel the two strong arms of her dad as he gives her a hug goodnight. 3. A. Illustrations. B. The brightly colored illustrations in this book are an interesting contrast to the soft and quiet mood the book creates. C. The book is drawn using vivid primary colors that include a red carpet, the family’s black cat and the dad’s green sweater. The oil based illustrations are drawn with solid colors devoid of much shading, all of which help support a simple child-like viewpoint. Primary colors are emphasized on things like the buttons of the girl’s yellow nightgown and the numbers on each page of text. The richness of colors is even displayed through the little girl’s own dark skin tone. Her dark brown toes on the first page stand in stark contrast to the solid red carpet on her floor and her sleepy face at the end of the book is snuggled warmly against a solid white stuffed teddy bear. The colors are a celebrated and comforting addition to the text of this counting lullaby. 4. This book can be used in an early elementary classroom to teach the skill of counting backwards. Children might be encouraged to think of similar things in their own rooms that they could count. This review has been hidden because it contains spoilers. To view it, click here. 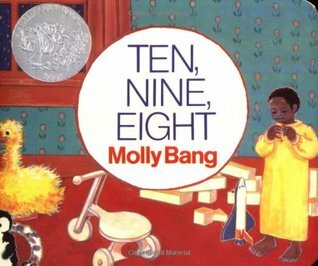 "Ten, Nine, Eight" by Molly Bang is so safe and reassuring, like warm milk, a soft, glowing nightlight or a sweet lullaby. I imagine toddlers everywhere drifting off to sleep, while counting down the wondrous, yet everyday objects, companions etc. in the little girl's bedroom. Parents, too, -perhaps more so- may find it difficult to keep their eyes open while reading it. In illustrations that range from shell pink to vibrant orange, the countdown begins with "10 small toes all washed and warm." "Ten, Nine, Eight" by Molly Bang is so safe and reassuring, like warm milk, a soft, glowing nightlight or a sweet lullaby. I imagine toddlers everywhere drifting off to sleep, while counting down the wondrous, yet everyday objects, companions etc. in the little girl's bedroom. Parents, too, -perhaps more so- may find it difficult to keep their eyes open while reading it. In illustrations that range from shell pink to vibrant orange, the countdown begins with "10 small toes all washed and warm." There are also stuffed animals, including a Raggedy Ann doll. A black cat, who we assume is the family pet, peers out the window at the snow falling gently outside and at a seashell mobile. But the most soothing aspect of the book's scenes is the father who partakes in a cherished bedtime ritual with his child before putting her in her crib. He holds her on his lap on a rocking chair and softly pats her as she yawns. She kisses him on the nose. 2. Summary: A father is putting his young child in bed, using a lullaby of counting items in the room from ten to one. 3. a) The greatest strength of this book is the ability to relate to the story and the items used to count down. b) I think parents and children can relate to this lullaby of bedtime. The strength of this book is the way the author uses objects in the room that the child can see. Other counting books go from one room to the next, but this book focuses on the items in the same room. It also shows the different types of objects that can be counted such as five seashells that are not identical. c) On number 9, it counts nine animals including real cat, mouse, baby doll, ragdoll, polar bear, blue monkey, yellow ostrich, snake, and penquin. I like how this book shows children that you can count items that don't have to look exactly alike, as in some counting books. Summary: This title tells the nighttime story for a little girl counting down to bedtime. The illustrations are bright, warm, and colorful and have a unique quality to them. The text goes along well the illustrations as it tells and depicts each item the young girl counts on the way to bed. a. Although this is a Caldecott winner I think that the text outweighs the illustrations in this title. a. Although this is a Caldecott winner I think that the text outweighs the illustrations in this title. b. The text in this title describes the things that the little girl counts in her room on her way to bed. The way the text describes each item is unique in that it gives the reader a sense of calm. In my opinion the text also allows the reader to feel love, comfort, and somewhat sleepy. Curriculum Connection: I believe this book would work well with pre-school and Kindergarten students to introduce counting. It would also work well when talking about prediction. You could discuss what the students think is going to happen next in the bedtime routine. I would also enjoy using this book during a rest time in the room. This was a very good book about a father putting his daughter to bed. They count various things in her bedroom and get closer to the bed each time they say a number. You can tell the father loves his daughter very much, and therefore you can tell how much effort the author put into the words of the story. A counting book would be difficult to add emotion to, since you are just counting things, but Bang did it with no problem. This book would be very helpful in putting a child to bed in a loving This was a very good book about a father putting his daughter to bed. They count various things in her bedroom and get closer to the bed each time they say a number. You can tell the father loves his daughter very much, and therefore you can tell how much effort the author put into the words of the story. A counting book would be difficult to add emotion to, since you are just counting things, but Bang did it with no problem. This book would be very helpful in putting a child to bed in a loving way. The illustrations were fantastic, each picture done with vibrant color and realism. The pictures help to convey the story by showing what the words are saying instead of just using text. The little girl who was being put to bed wore a bright yellow nightgown which made her stand out and showed her to be the focus of the story. B. The illustrations in this story reflect very well the theme of a count-down when putting a little girl to sleep. The illustrations show the setting, but none of illustrations show anyone talking, running, or making any type of noise. This adds a sense of quietness and calm in the story that reflects the theme of preparing for bedtime. Also, by placing the text in a small corner area on a large sheet of white paper, the white space provides a feeling of relaxations, and serenity that nicely sets a bedtime tone for the story. In addition, (pg 5) the little girl is in a room looking out at all of her stuffed animals, but the scene is illustrated in such a way as to make a dramatic effect. By only showing the little girl's feet at the bottom of the page, the reader is transported into the perspective of the little girl standing in the room, leaving to our imagination what she is telling them. All of these elements tell us that this bedtime story looks and feels like it time to go to bed. C. Can be used in a curriculum to introduce basic counting skills.